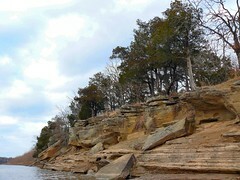 With today's low wind and high temps, it is clearly and excellent day for winter kayaking in Oklahoma. Naturally, you can't get weather like this on the weekend. I would take a sick day to go paddling on a day like this, but wouldn't you know it...I'm already sick. I picked up a head cold somewhere, so I will be spending this wonderful 70 degree February day at home sneezing like crazy. More warm weather is currently on tap for tomorrow, but the wind speeds and rain chances are higher as well. Since I am likely to be sick all week, I will miss this fine weather, hopefully you will be more lucky. If you do get out for some paddling, do me a favor and wear a PFD, the water is still quite cold. I've been trying to learn the ropes on FaceBook this week. With Spring kayaking season just aroung the corner and the Tulsa job market tightening, I thought that this would be a great time to expand my social network. I've already managed to form ties with a couple of my friends from the Oklahoma Flatwater Paddlers, a large amount of my wife's family and several friends from High School. I haven't figured out all of the applications on FB yet, but I cannot help but be impressed with its ability to locate old buddies that I have not spoken to in years. If you are a local paddler in the Tulsa area and you find yourself on Facebook, send a friend request for Thomas Jones in Okmulgee, OK. Maybe we can go paddling sometime soon. I hope to be hale and hearty again in time to make a trip to OKC for the Paddlesports and Outdoor Gear Swap at OKC Kayak March 6th and 7th. I recently aquired some neoprene waders, that would be excellent for Winter kayaking, but they are one size too small for my comfort. I also have some kayaking DVD's I could part with. Float trip outfitters throughout the Ozarks have begun inspecting their rivers in preparation for the Spring paddling season. The early February ice storms have created some serious timber issues this year for both paddlers and outfitters on the Buffalo River and the Kings River in nearby Arkansas. The last I heard, the popular Ponca-to-Kyle's-Landing Buffalo River float isn't possible because Kyle's Landing Access is closed. The nearest take-out to Ponca is the Erbie access 15 miles downstream. The Steel Creek access, just below Ponca, Arkansas is also closed. To check the status of the Buffalo National River access points, visit the Buffalo River park's Web site, www.nps.gov/buff or call park headquarters at (870) 365-2700. Water levels are up in many area lakes and rivers such as the Illinois River, the Mulberry River, the North Canadian River, The Buffalo, The Kiamichi River and even old muddy Deep Fork. Sadly, the winds were deadly, our prayers will be with the victims in tornado struck Lone Grove and Edmond, Oklahoma. Adding more excitement in my area is: powerline tree trimming by helicopter! You should see the high flying helicopter horror show happening right outside my window today. About half a dozen whirling blades dangling from a very low hanging chopper. Without a doubt...today is a scary day to be a squirrel! I got my kayak out this weekend and paddled for a couple hours on the North Canadian River, but the low water levels at the time made it more like plowing than paddling. At least it was a warm and fairly sunny day.